Along with Anadur, Deca-Durabolin, and Durabolin, this is another steroid containing the substance nandrolone. Dynabolon is a favorite among athletes since it brings good results with few side effects. Although it is often compared to Deca, its effect is milligram per milligram stronger. The reason is that it is slightly androgenic with an anabolic effect, thus it strongly promotes the protein synthesis. The increased androgenic component helps the athlete achieve a good strength increase and an accelerated regeneration. Those who have had good results with Deca will usually respond even better to Dynabolon. Athletes report a distinct, quickly effective, solid gain in muscles, which goes hand in hand with a significant gain in strength. The increase in body weight and the improved strength are the result of the water retention in tissues and joints. 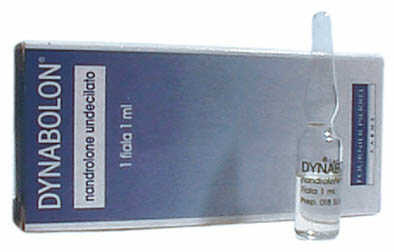 Dynabolon does not strongly aromatize in dosages below 4 ml/week. Dynabolon is effective for 1-2 weeks, thus requiring more frequent injections than Deca. Bodybuilders who work with this compound usually inject it twice a week. The minimum dosage is 2ml/week. A weekly dosage of 4 ml (equal to 322 mg) is usually sufficient for most athletes to achieve satisfactory results. This requires the injection of 2 ml (equal to 161 mg or 2 ampules) twice weekly. Higher dosages would certainly bring even better gains but often go hand in hand with distinct water retention. Such dosages also aromatize so strongly that anti estrogens must be taken to maintain the quality of the muscles. Women do well with 1 ml/week and rarely show virilization symptoms if the compound is not taken for more than six weeks. The side effects in men are quite rare and usually occur only in sensitive persons or when high dosages are taken. Possible side effects such as high blood pressure and elevated cholesterol levels, as well as acne or gynecomastia usually disappear without treatment after use of the product is discontinued. Dynabolon is tolerated quite well by the liver so that increased liver values occur only in rare instances. Unlike Deca it should not be taken if a hepatic disease or dysfunction exists. Dynabolon is hardly found on the American black market while in Italy and France the versions of Theramex are quite popular. In Germany the French Dynabolon of Theramex Company, Monaco, is often available. In small numbers, through various channels,these products then reach the U.S. This is a small yellow box which always contains only one ampule. As with all French steroids, the expiration date is printed on an extra-label which is attached to the back of the package. In addition, the ampule is shrink-wrapped and can be opened by removing a small piece of aluminum. The ampule itself contains 1 ml neutralized olive oil with 80.5 mg nandrolone undecanoate and usually costs between 15 $ and 20 $ on the black market. The red label on the ampule is branded into the glass and can be felt. It cannot be removed by fingernail or be scratched off. So far, no fakes of Dynabolon are available. Order Dynabolon and other steroids by mail order!